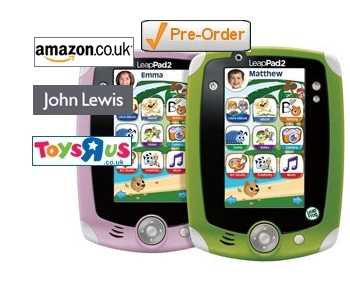 The new LeapFrog Leappad has an official UK release date of 1st August 2012. Amazon, John Lewis and Toys R Us are currently taking pre-orders on their websites whilst Tesco Direct will let you register for stock alerts. Argos, who are already stocking the Innotab 2 before all their competitors, have nothing yet showing on their website although a new catalogue is due out this Saturday which will most probably include it. John Lewis are quoting an expected delivery date of 3 weeks, which would currently be around 9th August, 9 days after Amazon. Stock shortages were a real problem last Christmas with the first LeapPad Explorer, however we have no word yet on whether LeapFrog have increased production of the LeapPad 2 to help cope with the expected large demand again this Christmas.